Ben Osborn scored a superb injury-time winner as Nottingham Forest hit back to beat fierce rivals Derby and relieve the pressure on manager Stuart Pearce. The Rams were gifted the lead when Henri Lansbury headed Johnny Russell's first-half corner into his own net. But Britt Assombalonga's scrambled strike deservedly drew Forest level. And Osborn secured a first win in nine games, shooting home from 18 yards to deny the Rams the chance to go top of the Championship table. A victory would have taken the Rams three points clear at the summit, prior to the afternoon kick offs. And although a Forest side lacking confidence and with just two wins from their previous 20 games were far from outclassed, a home win seemed likely when they trailed at the break to Lansbury's unfortunate own goal. But a much-improved second-half performance ended a miserable run which has seen them lose their last four games and has led to constant speculation that Pearce would be replaced by chairman Fawaz Al Hasawi. Forest's victory was their first at Derby since January 2011 when Robert Earnshaw scored the winner. The defeat was the Rams' third at home this season - and only their second in the Championship. The energy of Derby's wide men Jamie Ward and Russell suggested a different outcome early on - although Forest could easily have been awarded a penalty when Jake Buxton wrestled Michail Antonio to the floor from a corner. However the hosts were looking the more cohesive and, with Will Hughes dictating play in the centre of midfield, they took the lead when Lansbury lost the flight of Russell's corner and headed it powerfully into his own net at the near post. The goal sparked a spell of Derby pressure and a succession of set-pieces. Craig Bryson had a sidefoot effort blocked by Kelvin Wilson and Reds captain Jack Hobbs almost gifted the hosts a second goal when he made a mess of a dangerous ball into the box. But Forest were beginning to threaten in attack and the impressive Antonio almost teed up a chance for top-scorer Assombalonga after Lansbury's exquisite pass. The visitors continued to have the better of things after the interval but struggled to create clear chances until the Rams failed to clear a set-piece and Assombalonga was quickest to react and turn the ball in from close range for his 14th goal of the season. And with the game now open and increasingly frantic, it was Forest who made the most of their new-found impetus when Osborn crashed the ball beyond goalkeeper Lee Grant in time added on. Derby County head coach Steve McClaren: "I can't fault the first-half performance. We were focused, played when we had to, dominated and restricted them to set-plays. They were playing opportune football. "We didn't deserve to lose. I think a draw would have been about right. Everybody would have gone away satisfied with a draw. When they equalised, I would have taken the draw. "But we showed our inexperience at the end, thinking that with 30 seconds left we should go and try to win it. We lost all shape and got punished. "The first half we played like us, the second half was not us." Nottingham Forest manager Stuart Pearce: "For the team to deliver a performance like that, it puts a marker down for the rest of the season. "It's a nice result but it has to be a result that acts as a catalyst and sees us have a good run between now and the summer hopefully, because we have the nucleus of a decent squad here. "It's important that we now move forward from here and follow it up with another good result in the next game." Match ends, Derby County 1, Nottingham Forest 2. Second Half ends, Derby County 1, Nottingham Forest 2. Attempt missed. Johnny Russell (Derby County) left footed shot from the left side of the box misses to the left following a set piece situation. Substitution, Nottingham Forest. Jamaal Lascelles replaces Robert Tesche. Cyrus Christie (Derby County) wins a free kick on the right wing. Foul by Ben Osborn (Nottingham Forest). Goal! 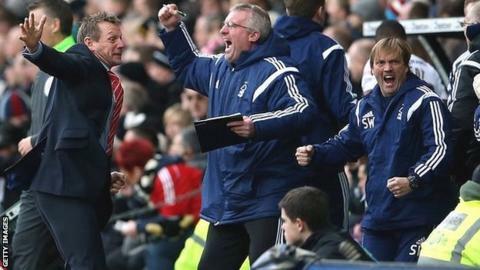 Derby County 1, Nottingham Forest 2. Ben Osborn (Nottingham Forest) left footed shot from the left side of the box to the bottom left corner. Assisted by Robert Tesche. Attempt saved. Robert Tesche (Nottingham Forest) right footed shot from the centre of the box is saved in the top centre of the goal. Corner, Nottingham Forest. Conceded by Craig Forsyth. Attempt missed. Chris Martin (Derby County) right footed shot from the centre of the box is high and wide to the left. Assisted by Richard Keogh with a headed pass following a set piece situation. Craig Forsyth (Derby County) wins a free kick in the defensive half. Foul by Stephen McLaughlin (Nottingham Forest). Foul by Chris Martin (Derby County). Jack Hobbs (Nottingham Forest) wins a free kick in the defensive half. Foul by Jake Buxton (Derby County). Britt Assombalonga (Nottingham Forest) wins a free kick in the attacking half. Chris Martin (Derby County) wins a free kick on the left wing. Substitution, Nottingham Forest. Stephen McLaughlin replaces Michail Antonio. Attempt missed. Robert Tesche (Nottingham Forest) right footed shot from more than 35 yards misses to the right. Chris Martin (Derby County) wins a free kick in the attacking half. Foul by Jack Hobbs (Nottingham Forest). Foul by Craig Forsyth (Derby County). Michail Antonio (Nottingham Forest) wins a free kick on the right wing. Substitution, Derby County. Darren Bent replaces Jamie Ward. Goal! Derby County 1, Nottingham Forest 1. Britt Assombalonga (Nottingham Forest) right footed shot from the centre of the box to the bottom right corner. Assisted by Jack Hobbs following a set piece situation. Omar Mascarell (Derby County) is shown the yellow card. Foul by Omar Mascarell (Derby County). Ben Osborn (Nottingham Forest) wins a free kick on the left wing. Attempt blocked. Kelvin Wilson (Nottingham Forest) right footed shot from the centre of the box is blocked. Assisted by Britt Assombalonga. Attempt missed. Michail Antonio (Nottingham Forest) header from the centre of the box misses to the left following a corner. Attempt blocked. Ben Osborn (Nottingham Forest) left footed shot from outside the box is blocked. Assisted by Todd Kane. Attempt missed. Jamie Ward (Derby County) right footed shot from outside the box misses to the right. Assisted by Omar Mascarell. Jamie Ward (Derby County) wins a free kick on the left wing. Foul by Eric Lichaj (Nottingham Forest). Chris Martin (Derby County) wins a free kick in the defensive half. Foul by Cyrus Christie (Derby County).